Irene Loves Elephants: Today: What Is Going On Here? Today: What Is Going On Here? I have just returned from a walk with Minnie, and spotted this in the shrubbery as I was walking up our driveway, in among the Raglan flowers. That is not the name of the plant, but as the cutting was sourced from Raglan and we have no idea what the plants real name is, we have always referred to it as the Raglan Flower. 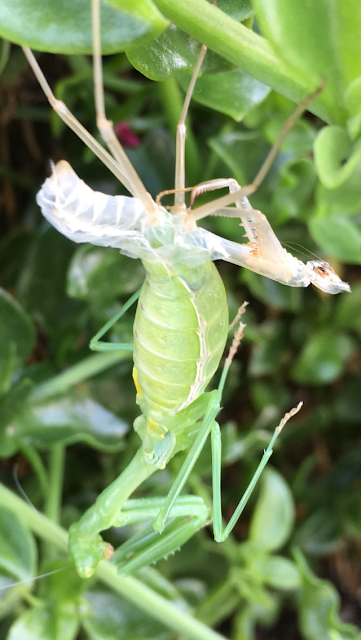 Anyway hanging on and I am not sure if it is alive or dead was this Praying Mantis, with a particularly fat belly. And attached to it's nether regions was either a carcass or possibly a newborn?